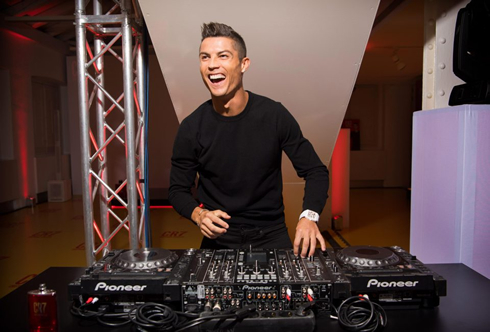 ﻿ Cristiano Ronaldo: "I'm proud of playing for the best club in the world"
08.09.2017 » Cristiano Ronaldo: "I'm proud of playing for the best club in the world"
Cristiano Ronaldo's empire became a bit bigger this week, as the Portuguese superstar released a new fragance to his collection, the all-new CR7 aftershave. In a public event held in Madrid, the 32-year old shared his thoughts about his new product and also confirmed he feels very happy in Real Madrid by playing down any eventual future departure stating that he's already playing for the best club in the world. The Merengues are already preparing their Champions League title defense. 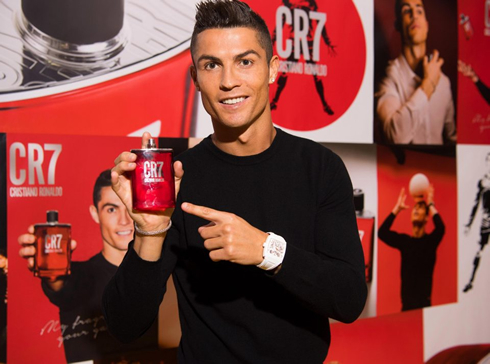 Regarding this new CR7 aftershave, it was Ronaldo himself describing it as a product that could be used by anyone on a daily basis, whether it's a man, a woman or just children. This fragancy is not the first he actually puts on the market and it will be joining the previous "Cristiano Ronaldo Legacy" and "Cristiano Ronaldo Legacy Private Edition" fragances. Ronaldo: "Smelling good gives me confidence. We could say it's one of my secret weapons and I always start my days with this CR7 fragance. I definitely feel better when I put it on and somehow it allows me to live each day to the full", started by commenting the Portuguese icon in front of journalists from all around the world. With 2 games left from his 5-game ban in Spanish competitions, Cristiano Ronaldo won't be able to play for Real Madrid this Saturday against Levante and he should only make his first appearance in La Liga on September 20, by the time Zinedine Zidane's men host Betis at the Santiago Bernabéu. However, he'll certainly start against APOEL Nicosia on Wednesday, when the Merengues make their debut in the 2017-18 edition of the UEFA Champions League. After winning back-to-back Champions League titles for the first time in the history of this competition, Cristiano Ronaldo strengthened his conviction that there is no club in world football bigger than Real Madrid. Cristiano Ronaldo: "I'm very proud of playing in Real Madrid and I'm well aware this is the best club in the world. We share the same goals and we all want to keep winning trophies", stated the Portuguese forward as he talked with a Spanish journalist from "El Golazo de Gol" while still presenting the CR7 fragancy. Ronaldo: "This is a very special fragancy for me. It reminds me of my childhood	and it has a strong scent of scent of cinnamon. I've always liked it and I actually eat it every day", confessed the 32-year old. The Portuguese star also revealed this has been a fragancy he has been working with his team for the past 3 years and that a lot of effort has been put into this project so his dream could be fulfilled. Cristiano Ronaldo next game is for Real Madrid on September 9 of 2017 against Levante. You can watch Juventus live stream, Real Madrid vs Levante, Barcelona vs Espanyol, Stoke City vs Manchester United, Arsenal vs Bournemouth, and Manchester City vs Liverpool, all matches provided from our football live game pages.